Abq Jew ® Blog: Sing Along with Joseph! 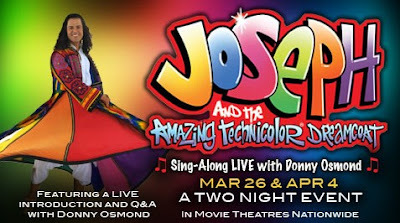 Joseph and the Amazing Technicolor Dreamcoat Sing-Along: Great news for Joseph fans (and who isn't?)! There's gonna be not one, but two sing-along events right here in the Land of Enchantment! The filmed version of this fully staged production, originally captured during its acclaimed run at London’s famous Pinewood Studios and specially remastered for this in-theater event, stars Donny Osmond playing the title role of Joseph. Presented in an exclusive never before seen sing-along version with subtitles for audiences to join in, this event also features an introduction with Osmond LIVE from Salt Lake City, plus a never-before-seen animated opening sequence which features an 80-piece orchestral overture. Following the production, Donny will be back for a LIVE Q&A session, with questions submitted from fans from all over the country. There have been sing-alongs for The Sound of Music for as long as Abq Jew can remember, which, at his age, isn't very long. Abq Jew hasn't paid much attention to these, because TSOM is just ... well, not Jewish enough for his taste. In fact, Abq Jew has never - since 1965! - seen the entire movie from beginning to end. Please tell Abq Jew when you're going! Sing along!